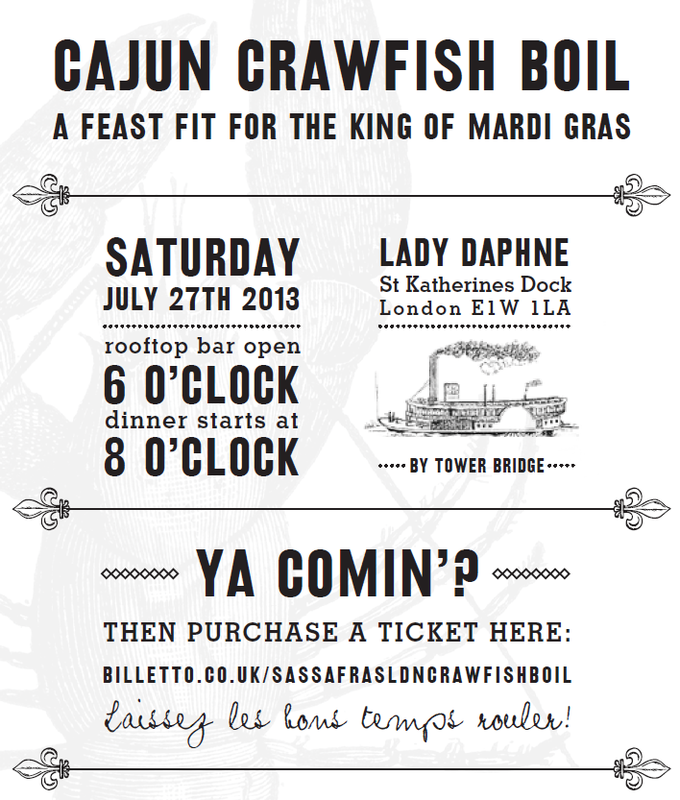 "In homage to the steamboats on the Mississippi river and the infamous Louisiana crawfish boil, we’re holding the next SASSAFRAS supperclub on a boat. 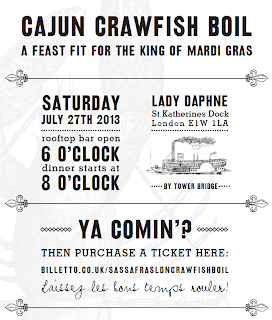 The venue is the beautiful Lady Daphne in St Katherine's dock. Dinner will be served below deck but the roof deck will be open from 6pm if you fancy grabbing an early drink and taking in the views. This time round we have a paid bar serving a range of American beers, delicious bourbon-based cocktails and a wine list. Crawfish boil, including sweetcorn, new potatoes, artichokes and a version with andouille sausage for those that like to surf and turf! Both served with homemade cornbread. Classic Southern dessert from Miss Amos, our pastry chef. You're also welcome to bring your own liquor of choice for the dinner. NOLA is world renowned for its jazz and blues, so after the success of the last supperclub, trumpeter Jay Phelps has pulled together an all-star brass line up to get the good times rolling. Crawfish boils are a summer tradition so we’re hoping the British evening sunshine will show up for the cajun ride."